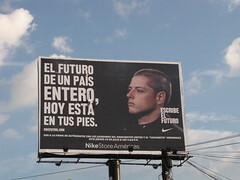 A billboard in Guadalajara features local soccer star Javier "Chicharito" Hernández and the warning, "The future of a whole country, today is at your feet." The admonishment reflects the pressure on Hernández, who now plays for Manchester United. Mexican soccer phenom Javier Hernández - better known by the handle, "Chicharito," or Little Pea - made his debut Sept. 14 in the Champions League as his club Manchester United took on Rangers. The debut, like everything he does with Manchester United, received major press attention back in Mexico, where the 22-year-old striker is fast becoming a living legend - especially in his native Guadalajara. Chicharito faces enormous expections in Mexico, where international soccer success has been elusive and players have generally preferred to earn solid livings in a domistic league flush with cash from the nation's broadcasting duopoly instead of challenging themselves in tougher European leagues. The lad appears ready. He comes from a solid, middle-class family, never indulges in vices such as smoking and drinking, according to his granddad, and never gets caught up in any scandals - unlike, say, aging striker and current Mexican soccer demigod Cuauhtémoc Blanco, who showed up for World Cup camp overweight and out of shape. He also speaks excellent English and was pursuing a university degree at UNIVA in suburban Guadalajara as he rocketed to soccer stardom last year with Chivas, the legendary Mexican franchise that doesn't field foreign-born players. His family has even moved to England with him. I tracked down Chicharito's graddad - a former Mexican international and Chivas player - in late July, when Manchester United passed through Guadalajara, for story that ran in The Sun. Read it here, or click on the title.